This dish combines two of my favorite things: seafood and tacos. I’m not sure when I became such a huge fan of seafood. Maybe the lack of availability in Minnesota, where I grew up, made me appreciate it more once I moved to the East Coast. I now cook with seafood any chance I get, especially if the seafood is caught locally or by someone I know. 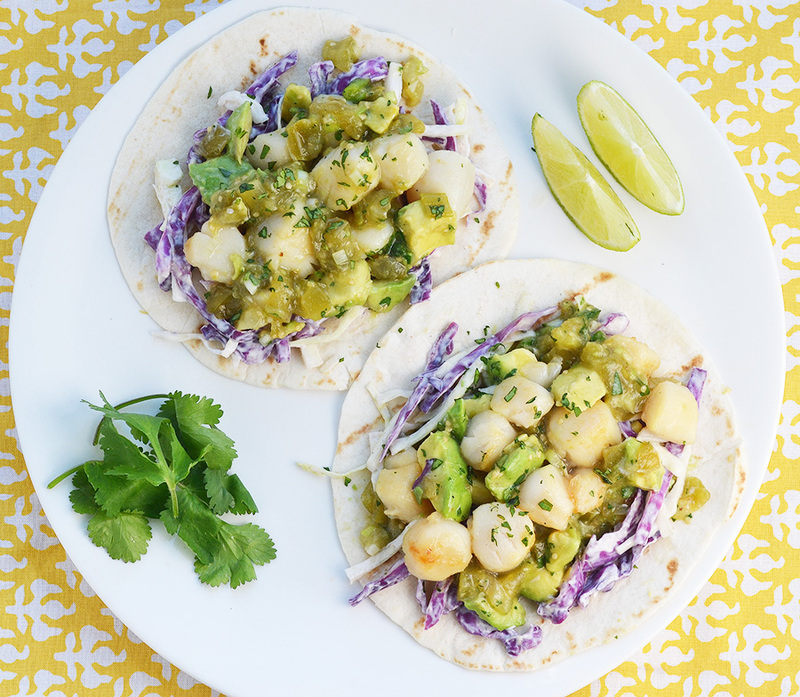 And this is exactly how I came up with these scallop tacos with avocado salsa verde and cumin scented slaw recipe. The north fork of Long Island is full of wonderful fish and seafood from the surrounding Peconic bay and Long Island Sound. I often look forward to long days of clamming in the summertime or slurping fresh oysters in late fall. This year there was an abundance of bay scallops in wintertime. I was lucky enough to have the opportunity to cook with these at my father’s place out on the North Fork. These fresh little bites of the sea are so tender and sweet. They are perfect in salads, soups, stews, or just by themselves but paired with creamy avocado and tangy tomatillos, they really come alive. Similar to fish tacos, this recipe needed a crunch to complete the total package. Slaw was a natural choice but instead of a mayonnaise version, I went with sort of a Mexican crema version. The dressing is simply crema (sour cream and heavy cream combo) and cumin, giving it that hint of classic Mexican-American food flavor. The crunch of the cabbage with the smooth spicy salsa and delicate scallops are an addictive combination when wrapped in a warm flour tortilla. Whether you make this for lunch, dinner, or even a Cinco de Mayo celebration – this shellfish twist on classic fish tacos is sure to get the fiesta started. Heat 2 tablespoons of olive oil in a medium sauté pan over medium heat. Sauté tomatillos, 1/3 of the scallions, and garlic for 5-10 minutes until softened. Remove from heat and chill. Dice avocados and add lime juice, tossing to coat. Add avocado along with jalapeno, remaining scallion, and cilantro to the tomatillo mixture. Stir to combine. Place sliced cabbage in a medium mixing bowl. Mix sour cream with heavy cream in a small bowl. Drizzle cream over cabbage, tossing to coat. Add cumin and salt to taste. Mix well. In a large sauté pan, heat remaining olive oil over medium-high heat. Add bay scallop and sear 2 minutes, stirring after 1 minute to sear the other sides. Remove from heat. Heat tortilla a tortilla in a dry pan (optional). Place a few spoonfuls of slaw in the center of a tortilla. Add a spoonful of salsa verde. Add 6-10 scallops (depending on size) and another spoonful of salsa verde. Sprinkle with remaining cilantro. Serve warm. I am delighted that I have just found your site. One of my most treasured book is your grandmother’s book on baking. Every winter holiday her pecan balls are an absolute must – even if I don’t bake anything else. I have had this book since the sixties and it is always at hand even though I have over three thousand other cookbooks. Definitely desert island top-ten list. Thank you for this site and for keeping her reputation alive. Thank you June! I’m so glad that you treasure my grandmother’s baking book as much as I do. I’ve actually never tried her pecan balls – I will have to add to the list. Her holiday baking recipes are usually exceptional! Thanks again for commenting and I hope you enjoy the site.